If there is a universally popular wild mushroom, it may be Boletus edulis. The French refer to them affectionately as cèpes, the Germans glorify them as Steinpilz, and the Italians are wild about their porcini, meaning piglets (pigs compete for them). The Swedish refer to their treasures as stensopp. In Poland, borowik are canned and sold in the market. The Russians claim byelii-greeb sustained them during wartime when other food was not available. In this country, B. edulis is sometimes called "king bolete." Many people use different types of these "hamburger bun," brown-capped, bulbous-stemmed, pore-bearing early fall delicacies interchangeably with B. edulis. Most mushroom hunters commonly refer to all of these mushrooms as "boletes." In this book, we will refer to fresh B. edulis as cèpes, and dried B. edulis as porcini. 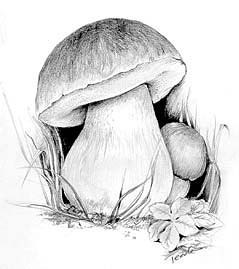 The genus Leccinum, "scaber stalk mushrooms," with white pores and black scales on their white pillarlike stems, and the genus Suillus, "slippery jacks," with sticky caps, gray-white to yellow pores, and narrower stems are among the edible boletes. However, those with red pores must be avoided. They are dangerous. In general, fresh firm specimens are best for cooking or drying. Discard wormy ones or those with soft brown decomposing flesh. Leccinum and Suillus as a rule grow in association with specific trees in a variety of plant communities. By contrast, B. edulis is most commonly found in pine forests. Boletes are different from other mushrooms in that they have pores rather than gills on the underside of the cap. Spores are released by the thousands from the inner walls of hundreds of tiny round tubes, making up the lower cap surface. This spore-bearing area resembles and acts like a sponge. About ten days after the first heavy rains fall in the west, in September or October, young forms begin mounding up the pine needles under the trees. In the east, this occurs during the summer months. They are frequently found in large numbers. Specimens of differing ages are found at the same time. In some locations the season can last for four or five weeks. B. edulis is indeed grand and hardy to behold, with its fat, bulbous stem decorated at the top with a network of lacy white veins and its nourishing brown cap held high above the forest floor. Leccinum species as a rule are found near madrone, aspen, and birch trees and manzanita bushes. People from Slavic countries revel when they find species of Suillus. These are most often found near pine trees and must be collected young. Suillus granulatus has a perfumed odor and is commonly found near Monterey pines. Usually it is pickled for later use. Older boletes should have their pores removed at once if they are soggy or green. This portion of the cap is not good-tasting, cooks poorly, and is impossible to dry. This is not a problem with young firm specimens. The minimum use of water is important. Try not to allow water to enter the pore surface, for it tends to absorb a great deal of moisture. Remove any dark parts of the mushroom. Brush off the caps of Boletus and Leccinum. Peel off slimy tops of Suillus. If old, gently separate the spongy material from below the cap, using your finger or a knife, and peel off carefully. Check the underside of the cap for worm holes. If there are many, discard the cap. If only a few exist, use the parts not affected. These mushrooms can be slippery. To reduce this quality, quickly fry slices in oil or butter. The simplest method of preparation is to sauté them in olive oil and butter, then add a rich brown sauce and serve as a side dish with steak, broiled chicken, or fish. Or layer fried mushrooms over rice, or baked, or mashed potatoes. Another way to quickly prepare boletes is to dip thick slices in beaten eggs,then dust in seasoned bread crumbs for deep-frying. It has been observed that the fresh Boletus edulis flown here from Italy has a stronger odor and taste than the same mushroom found in this country. From this and from similar observations made of other mushrooms, it may be concluded that botanically identical species of mushrooms from different localities may have noticeably dissimilar characteristics of size, odor, and taste. This suggests that, in part, subtle chemical and physical differences may result from the habitat in which the mushrooms grow. Boletes change rapidly. They should be used or preserved as soon as you bring them home. In the United States, the most common method of preserving boletes is to dry them. Cut them into lengthwise slices no less than1/2 inch thick from cap to base including the stems (see Preserving). Boletes may be frozen and stored after being sliced into l/4-inch slices and placed in a freezer bag. They will keep well for 6 months (see Preserving). Pickled boletes may serve as a conversation piece for your cocktail party. As a rule, 3 ounces of dried boletes will equal 1 pound of rehydrated mushrooms. Much variation is found in chefs' opinions as to how long to soak them. On the average they are soaked for about l5 minutes in warm water to cover. Heat hastens the rehydration process. The length of time depends upon the thickness of the slices. Squeeze dry, but be sure to save the liquid in the bowl to preserve the rich flavor for use in your dish. Dried boletes have a deep, rich taste that dominates soups and sauces for polentas and pastas. When you cook with dried B. edulis your kitchen will be redolent with its powerful fragrance. The essence of the mushroom persists in the cooking pot even after the pot has been washed and dried. Cut mushrooms into desired sizes after soaking. In general, the larger the pieces, the more flavor. Some chefs prefer to sauté them quickly in olive oil and butter before adding them to the dish they are preparing. Add the remaining soaking liquid to your food preparation by carefully pouring off the concentrated essence from the top, discarding any residual matter such as sand or soil at the bottom of the vessel. Dried bulk or bagged boletes command high prices in the marketplace. The imported Italian boletes (porcini) are usually dark in appearance, and their smell is intense and aromatic. Home-dried preparations do not have the same odor and are lighter in color. Old-timers claim that dried mushrooms develop a deeper, more robust aroma if kept for two or three years. When you shop for dried boletes, inspect them carefully to be certain there are no gilled caps present. Sometimes mushrooms of lesser quality are mixed with or substituted for B. edulis. Bagged products may also contain broken and granulated brittle pieces of fungi which will not reconstitute well and have little taste. Purchase only solid, clean, thickly sliced mushrooms. Imported Polish boletes seem to require long soaking periods. They must be reconstituted overnight before cooking. A hearty brown sauce to serve with grilled steaks. In a heavy saucepan, reduce the broth and wine over high heat until it starts to thicken, then lower the heat and reduce to 1-1/2 or 2 cups. Remove from the heat. Sauté the shallots in the butter in a saucepan. Raise the heat. Add the mushrooms and sauté until most of the juice evaporates. Add the reduced broth and wine mixture. To use this sauce with steak, deglaze the pan with red wine or brandy and add to the sauce. The strong flavor of dried Italian boletes makes an outstanding gravy. Serve over ravioli, pasta, polenta, or use for a chicken cacciatore. Sprinkle freshly grated Romano cheese on top. Soak the mushrooms in warm water to cover for about 15 minutes, squeeze dry and finely mince them. Reserve the liquid. In a large, heavy saucepan, sauté the beef and sausages until lightly browned. Add the onion, garlic, parsley, mushrooms, and herbs. Mix the tomato paste with the wine. Add to the gravy along with the tomato sauce and the soaking liquid from the mushrooms. Simmer until thick, about 30 to 45 minutes. Make this crunchy treat when Boletus edulis is in season. Preheat a deep-fryer to 300º to 330º. Using a vegetable slicer, slice the stems as thin as possible. Spread the slices on paper towels. Heat the oil very slowly to 380º. Drop a few chips at a time into the fryer basket and cook quickly. Shake the basket or stir so that they don't stick together. Cook until golden in color. Drain on paper towels and sprinkle with salt. A variation of a favorite dish served in Germany and Austria, where it is called Steinpilz auf rheum. Cut the caps and stems of the mushrooms into small slices. In a sauté pan or skillet, sauté the shallots in the butter until translucent. Add the mushrooms, ham, rosemary, and parsley. Sprinkle in the flour and stir in the broth. Adjust the taste by adding salt. Simmer for about 15 minutes. To make the dumplings, in a saucepan sauté the onion in butter until translucent. Add the bread cubes, mixing them with the onions and butter. Remove the bread mixture to a mixing bowl and add the milk, parsley, and nutmeg. Let it stand about 10 minutes. Be careful not to get the bread too wet. Add the eggs and salt and knead with your hands. Add the flour gradually until the mixture holds together and forms a ball. Moisten your hands with water and form the mixture into round balls. Gently place the dumplings in a large amount of boiling salted water. Cook them gently over medium heat, occasionally turning them with a slotted spoon for about 10 minutes, or until the balls float to the surface. Drain the dumplings. Divide them among the soup bowls and pour the hot mushroom soup over them. Fresh boletes are cut into the same size as new potatoes and baked in a Madeira-cream sauce. Cook the potatoes in boiling salted water to cover until tender. Drain; peel the skins and cut into cubes. Set aside. Cut the mushrooms into cubes similar in size to the potatoes. In a saucepan, sauté the mushrooms in the butter. Remove them with a slotted spoon when they are browned. Mix the flour into the juices remaining in the saucepan. Add the cream and whisk over low heat until thickened. Add the Madeira and allow the sauce to thicken again. Add salt and pepper to taste. In a buttered casserole dish, mix the potatoes and mushrooms together. Pour the sauce on top and bake in a preheated 350º oven for 20 minutes or until it brown and bubbly. Some bolete caps are large enough to be served cut into quarters or sliced into wedges like pieces of a pie. Shellfish, meat, and spinach can be used for fillings. Remove the bolete stems and save for another dish or dry the stems for future use. In a sauté pan or skillet, sauté the tops of the mushroom caps in the olive oil for a few minutes or until they turn brown. With a slotted spoon remove them to a warm baking dish. In the oil that remains in the pan, sauté the garlic and prosciutto until the garlic is translucent. Allow the mixture to cool somewhat, then stir in the egg, Parmesan cheese, bread crumbs, basil, salt, and pepper. Stuff the caps and bake them in a preheated 400º oven for 15 to 20 minutes or until lightly browned. A clever way of presenting this delicious mushroom. Serve it with a mushroom cream sauce and/or grate bits of truffle on top. Soak the mushrooms for about 15 minutes in warm water to cover, squeeze dry, and puree. Reserve the soaking water. Place the flour in a mound on a pastry board. Make a well in the center of the mound of flour. Crack the eggs into the cavity and add the salt. Add the dried mushrooms. With a fork, mix the eggs, salt, and mushroom puree. Then slowly start to incorporate the flour from the lower part, pushing it under the dough to keep the compacted dough ball intact and separated from the surrounding loose flour. If the flour fails to hold together during kneading, sprinkle some of the mushroom liquid on it. If the dough is too soft, add more flour. After half the flour has been incorporated into the dough ball, start kneading the mass with the palms of your hands. Lay the dough ball on top of the flour and continue kneading until the ball has absorbed most of the flour. Sift the leftover flour and set it aside for sprinkling during the rolling and folding steps later. Cut the dough ball into 2 pieces. Repeat the rolling and folding steps with each of these 2 pieces. Turn the pasta rollers to their widest setting, and feed one of the 2 pieces of dough between the rollers. Remove the rollers, and fold the dough into thirds, and press down. Sprinkle with flour and feed through rollers again. Repeat the folding, sprinkling, and rolling 8 to 10 times, until the dough is very smooth. Repeat the procedure with the other pieces of dough. Adjust the roller setting to a narrower notch, and pass the sheet of dough through only once. Do not fold again. Now move the rollers to each successively narrower notch, passing the dough through each notch only once, until the sheet is paper thin. If you don't have a pasta machine, knead the dough for about 10 minutes, until smooth and elastic, then divide the dough in half and roll each piece to a thickness of 1/8 inch or less. Lay the completed sheet of dough on a floured surface to dry for 15 minutes before cutting, and proceed with the forming of the second sheet. To cut fettuccine, pass each sheet of pasta through the wide teeth of the cutting section of the pasta machine, or cut by hand into 1/4-inch ribbons. Two to three Boletus edulis, weighing about 1-1/2 to 2 pounds total, are enough to provide a meal for four people. The caps are sliced and then deep-fried for an appetizer, and the stems are chopped, sautéed with shallots and cream, and made into a sauce to serve over tagliarini. Remove the stems from the mushrooms and reserve. Cut the mushrooms into 1/2-inch slices and dip them in flour. Deep-fry at 375º until golden brown. Remove with a slotted spoon and drain on paper towels. Sprinkle with salt and pepper and serve with lemon wedges. In a sauté pan or skillet, sauté the shallots and chopped stems in butter until hazel colored. Add the lemon juice. Add the cream, salt, and pepper and cook at a very low temperature for about 10 minutes, stirring gently. Cook the pasta in a large amount of boiling salted water until al dente and drain. Pour the sauce over the pasta in a serving bowl. Generously sprinkle the cheese on top. The next time you roast a turkey, insert small pieces of unsoaked dried Italian boletes (porcini) under the skin of the breast of the turkey. You may also want to add a small handful of soaked porcini to a simple bread stuffing; use the soaking liquid to moisten the stuffing. The strong flavor of the porcini will penetrate throughout the meat. Serve this dish with wild rice and a white wine. Soak the mushrooms in warm water for about l5 minutes. Squeeze dry and chop into small pieces. Reserve the mushroom liquid. In a sauté pan or skillet, sauté the mushrooms, garlic, and onion in the butter for about 3 minutes. Remove the mushrooms with a slotted spoon, leaving some of the butter in the pan. Set the mushrooms aside. In the same saucepan, add the oil and sauté the chicken until browned. Add the mushrooms,tomatoes, herbs, wine, and reserved mushroom liquid. Add salt and pepper to taste. Cover and cook over low heat for about 30 to 45 minutes or until the chicken is tender. This hearty bread is strongly flavored by the boletes. The grated zucchini keeps the bread moist. Grate the zucchini, then place it in a clean dish towel and twist it to remove as much liquid as possible. Grind the mushrooms in a blender or food processor, allowing the fine particles to settle before removing the cover. Mix the ground mushrooms into the melted butter and allow it to cool somewhat. In a bowl, combine the flour, sugar, baking powder, baking soda, salt, and 1/4 cup of the cheese. In a mixing bowl, beat the eggs slightly. Add the buttermilk and grated zucchini. Mix the dry ingredients into the egg-zucchini mixture (do not overbeat). Add the butter-mushroom mixture and blend. Spoon into a greased loaf pan and sprinkle the remaining cheese on top. Bake in a preheated 350º oven for 55 to 60 minutes or until it is brown and crusty on top. Cool 10 minutes before removing from pan.